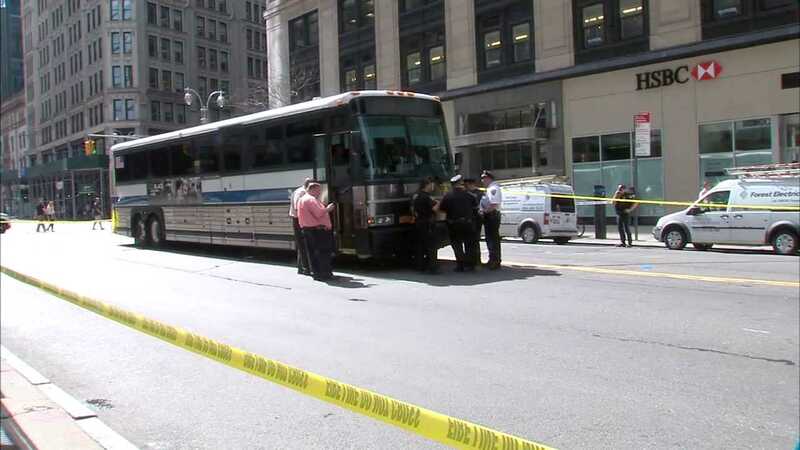 NEW YORK (WABC) -- A woman was fatally struck by an MTA Express bus while crossing 57th Street between Broadway and 8th Avenue Thursday morning. According to a spokesperson, the 69-year-old woman was crossing in the middle of the street, not in a cross walk, when she was hit by the front left side of the bus around 9:40 a.m.
She was knocked over and then run over. The victim has been identified as Rochelle Wahrman of Manhattan. She was rushed to New York Presbyterian Hospital, where she later died. Police identified her as Rochelle Wahrman, who lived on the Upper East Side. The bus driver is being interviewed. It is unclear how many, if any, passengers were on the bus -- an X1 that runs between Manhattan and Staten Island -- at the time.